Everyone needs a basic set of tools for the household to make minor repairs or to beautify their home in some way. Now, one of the more important tools that you can own is a cordless screwdriver to make small tasks even easier. While there is no denying that this tool is an essential part of your toolkit, it can also be rather difficult to find the best cordless screwdriver. This is because the ideal tool needs to be compact and lightweight, have optimal power, and be suitable for a number of tasks. To make it simpler for you to decide which cordless screwdriver was right for you, we compiled the information that you would need to have below. 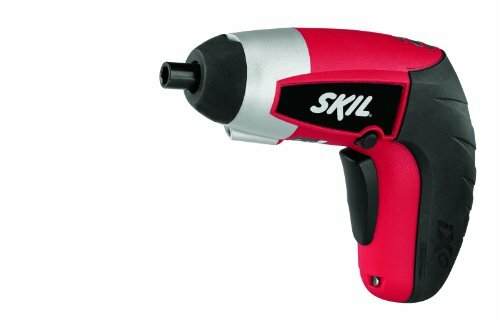 While this cordless screwdriver can easily fit into the palm of your hands, it also packs quite a punch. It produces a torque of 35 in-lb and produces 180 rpm. This means that you can use this tool for a number of different tasks around the house. You will have no trouble at all assembling furniture, installing mini blinds, or carrying out similar tasks. Another point in this cordless screwdriver’s favor is that it is incredibly compact. As such, you will have no trouble at all to get it to work in small spaces, giving it even more versatility. Furthermore, the point of the screwdriver is able to move either in a clockwise or anticlockwise movement, allowing you to both set and remove screws. This screwdriver is accompanied by two bits which means that you will not have to purchase other parts if you aren’t going to do extensive work with the tool. Now, this is a rechargeable screwdriver which means that you don’t have to worry about constantly replacing batteries. After a few hours of charging, you will be able to use this screwdriver for quite a while. The main issue with this screwdriver is that there is no indicator light for the battery. As such, it can be difficult to know when it has finished charging. 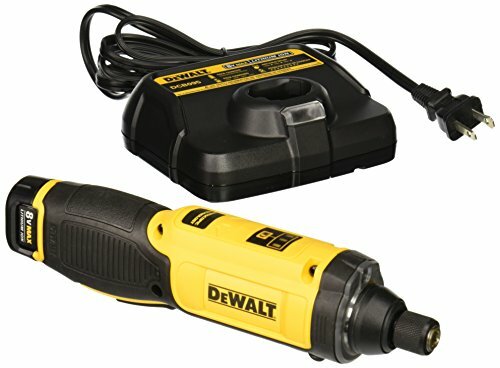 If you are looking for a greater number of features for your cordless screwdriver, then you will find that this DEWALT device is just what you need. To start with, you can choose to employ either the driving or the reversing fasteners on this tool. 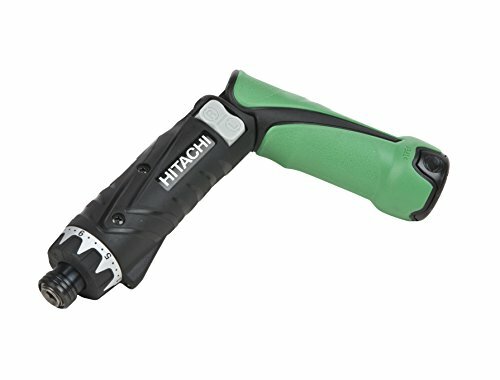 Also, you can utilize the impressive speed and efficiency of the screwdriver with up to 430 rpm. Now, it should be noted that many of the features on this screwdriver are motion activated. On the upside, this means that you don’t have to fiddle around with settings or buttons. At the same time, there is a learning curve associated with this screwdriver and so, it can take a while to get the hang of it. The good news is that once you learn how to use the screwdriver properly, you can use it for most light tasks and with a variety of materials such as plastic, wood, and even light-gauge metal. The compact size of the screwdriver ensures that you will have no trouble maneuvering it in small places while the built-in light makes it a lot easier to see. Not only does this screwdriver boast a longer run-time, but it can also charge within an hour. The charging process is made even easier by the battery indicator that shows its progress. 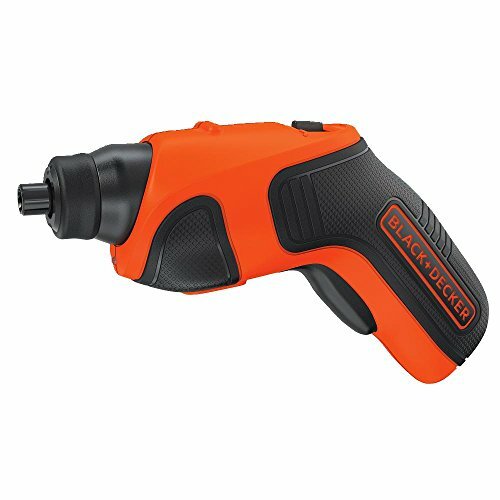 One of the features that really stands out with this cordless screwdriver is its dual position handle. This provides the device with the ability to be either straightened or folded, depending on the task you need to complete. As a result, you can easily make the screwdriver more compact, allowing it to fit into smaller spaces. Unfortunately, the device can’t be locked in either position which can make it a little bit trickier to use at times. The other great thing about this device is how versatile it is. For instance, there are twenty-one clutch settings and one drill setting that can easily be adjusted so that you can carry out a greater number of tasks. To add to this, the forward and reverse switch on the screwdriver can be changed without a problem and you can also choose between two rpms – 260 and 780 so that you can customize the settings for the task. There is a small LED light that helps to illuminate small and darker spaces, while you are working. The lithium ion battery for this screwdriver further adds to its performance. For one thing, you are assured continuous power until the battery runs out. Afterward, it can be recharged rather quickly as well. Unfortunately, there is no battery indicator that tells you when you need to charge the screwdriver. 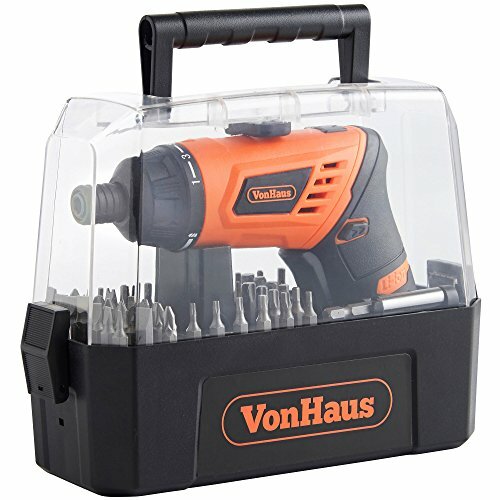 If you can’t be bothered buying additional bits for your electric screwdriver and want a fully outfitted kit, then you will see that the VonHaus package has everything you need. This is because, along with the powerful electric screwdriver, there is also a 50 bit set that you can easily snap on and use to complete a myriad of tasks around the house. Of course, you should be aware that these bits aren’t exactly of the highest quality and are meant for more minor tasks. Still, this cordless screwdriver has quite a bit of torque at 210 rpm and so you shouldn’t have too much trouble getting through most materials of medium thickness. Also, there are 15 + 1 settings to choose from as well. One of the other perks of this screwdriver is that there are three position options for the handle, making it easier for you to get it into a more comfortable position to use. The screwdriver features are also combined with an LED light that is perfect for illuminating those darker areas that you are trying to work in. The rechargeable battery is also quite good and lasts a while too. You can easily charge it to its full capacity in a matter of a few hours. Compact and easy to grasp, this is a cordless screwdriver that almost anyone will feel comfortable using, even without any prior knowledge. It also has just enough torque and power to make it a useful household tool, perfect for carrying out smaller or lighter activities. Another point that makes this screwdriver quite so useful is the fact that it comes with 5 bits, saving you the trouble of having to buy any additional pieces. Then there is the fact that the screwdriver is equipped with a long-lasting lithium battery. Not only is it capable of lasting up to 18 months, but it can also be charged easily. A battery fuel gauge lets you know when the screwdriver needs to be charged. This screwdriver is also great for various spaces and conditions as it has a built-in LED light to make your tasks a lot easier to complete. The only real flaw with this device is that it the settings for the directional change are in an unfortunate position and can be easily activated or changed. If you want to purchase a cordless screwdriver that is ideal for the tasks that you want to complete, then you need to know which factors are important. This section deals with all that and more. Nickel-Cadmium Batteries: these still tend to be one of the more popular rechargeable battery options on the market and with good reason. These batteries tend to be incredibly durable, which means that they will last longer than other types. However, they do have a relatively low capacity and can’t be used for too long as you have to maintain a certain battery capacity. Lithium-ion Batteries: these days, lithium ions are taking over and it isn’t difficult to see why. For one thing, these batteries boast higher capacities and are also quite lightweight to boot. Perhaps what really sets them apart from the competition, though, is that they can quickly and easily be recharged and tend to be rather low-maintenance as well. The main downside is that they can be a bit pricier than other options. Nickel-Metal Hydride Batteries: while these aren’t as common as the other two options, they still have their advantages. They are lightweight, less costly, and have a rather impressive capacity. Unfortunately, they can be rather sensitive to temperature fluctuations and thus, require a greater deal of maintenance. The torque of the cordless screwdriver is what determines how much force is produced, thus allowing the screwdriver to drill in. So, this stands to reason that a higher torque can often be useful. This means that the screwdriver is able to produce a greater amount of force, thus making it more versatile and suitable for more tasks. At the same time, it is just as important that there are torque settings on the screwdriver that you purchase. This is because you can’t use the same level of torque for each task. Sometimes, you will require less so that you can prevent drilling a deep and considerable hole into whatever material that you are working with. The speed of the screwdriver is referred to as rpm or rotations per minute. The higher the number, the quicker the screwdriver works. As a result, you will be able to screw in or unscrew screws that much faster. We have already tackled the topics related to the battery but there are still some other factors to consider. For instance, you should get a battery that should take only a few hours to recharge so that you can use it more quickly. Also, the battery should be able to maintain the same level of power throughout the entire cycle. You will then have access to the same level of efficiency while using the drill. Last but not least, it can be quite helpful to have a battery that has an indicator of some kind. This will provide you with a clearer idea of when you need to charge the screwdriver and also when it has been fully charged and needs to be removed. Now, one of the main benefits of a cordless screwdriver is that it is a great deal more compact than traditional options or more high powered tools. If you want to improve on this design even further, look for those with foldable handles. You will find that there are some cordless screwdrivers that can either be folded into a pistol grip or flattened out into a straight grip. By being able to do so, you can change just how much space the screwdriver takes when it is being used. Thus, you will find it easier to fit the tool into tighter spaces. Finally, you should get a cordless screwdriver that is simple to use. Now, this doesn’t just refer to the tools that have buttons and settings that are easy to work, although this is important. This is also related to how easily you can change the bits out of the screwdriver when you are using it. You should be able to swap the bits out without any hassle at all, making it a lot simpler for you to complete household repairs and tasks. Additional Bits: if you don’t have your own tools, it can be helpful to choose a screwdriver that is also equipped with its own bits. This way, you can save yourself the trouble of having to find compatible ones later on. LED Light: when working in tight spaces, it can be difficult to see what you are doing. However, if you get a cordless screwdriver that is already equipped with an LED light, then it is simply a matter of utilizing this light to see more clearly. Comfortable Grip: you should also look for a screwdriver with a comfortable grip, so that you can relax your hand in a more favorable position, thus being able to use the device more easily. To conclude, the best cordless screwdrivers are compact, lightweight, have variable settings that are easy to use, and can be charged very quickly. If you want a budget-friendly option, you will find that the BLACK+DECKER model is the best model for you. On the other hand, if you are all about the power, the DEWALT cordless screwdriver will have more to offer. If you prefer a cordless screwdriver with more variable positioning, you can rely on either the VonHaus or Hitachi model. In terms of battery, though, you will find that SKIL is superior. This concludes our look into the best cordless screwdrivers. You will now have a better idea of what to look for in such a product and will also be aware of what models are right for you.